In the latest detour for 'Postal,' a young boxer seeks help from Mark to defeat the despicable Mulvey at the annual "barn brawl." It's Mayor Shiffron's brutal bare-knuckle fighting match to help entertain the local citizens with some exciting bloodsport. Unfortunately, Curtis is sans one hand because of unpaid gambling debts so Mark has his work cut out for him. The arrangement benefits Mark too. He studies fight footage to look for weaknesses in Mulvey that most people would miss and Curtis helps Mark win over Maggie. It's an elaborate way for writers Matt Hawkins and Bryan Hill to address the awkward Mark-Maggie relationship with some honest and meaningful discussions that advances their character development. This second arc has brought on some surprises and peculiar new directions, but there might be a method to the writers' madness. There is some foreboding at the start with the letter from Mark's dad. A larger plan is at play, one that requires some additional world-building. Thus, the introductions of new denizens of Eden and it works. The writers paint a clearer picture of the type of folks who found refuge in Eden, hiding from a shady past or a dubious present. Yet, 'Postal' is about Mark Shiffron. The town postman with Asberger's remains the focal point. He's the detail-orientated young man infatuated with Maggie and the most innocent figure in a town full of morally ambiguous people including his mother. Mark has used his particular set of skills to great effect in this issue. Isaac Goodhart does solid work again with more action than usual. The fight scenes are energetic and impactful, with decent choreography however brief. Betsy Gonia saturates scenes with familiar earth tones, keeping a sepia-toned noir veneer. 'Postal' #7 throws some new surprises that work. The narrative continues to shift, but Mark is still the most compelling figure. 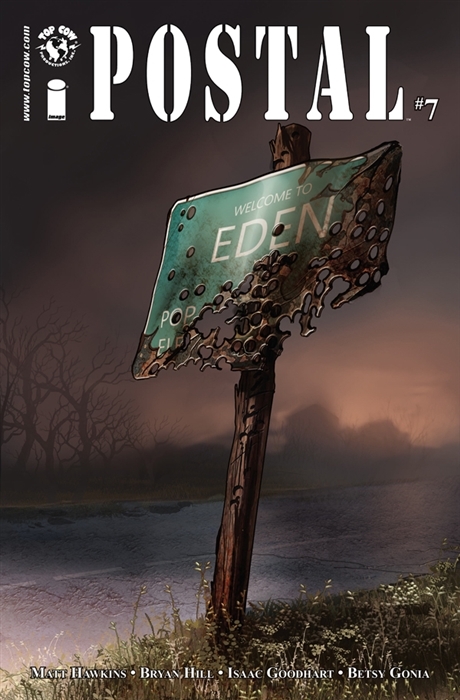 The shady business of Eden is seen through Mark's eyes and there seems something big is coming that he won't even anticipate. All the more reason to get aboard 'Postal' now.